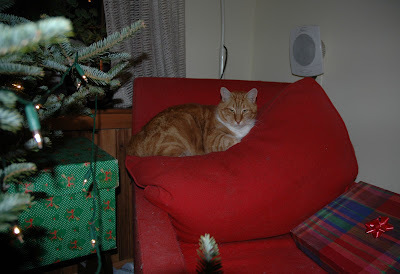 Bits of My Own: The Cat Who Came for Christmas! The Cat Who Came for Christmas! The last thing I needed, the very last thing I needed, was another cat! Hermie had been casually visiting for the last 3 years, however during the last year I became aware that he was completely dependent on me for food. Also, it became apparent that he had no place to go. At one time he belonged to someone who was renting across the street, but apparently they thought he was disposable, and just left him when they moved. We noticed that he was no longer crossing the street, and just before Christmas we found him crouching under the tarp on our wood pile. Hermie as it turns out, is quite a character, and has made himself at home! (Why do they always have to sit on the top of the chair)!?! Of course this has not gone unnoticed by the other cats who clearly do not appreciate this interloper! They were used to seeing him outside, but sleeping on the bed is another matter! There has been quite a lot of howling, growling, spitting, and the occasional fur flying! Hopefully soon they will all become used to him. Christmas generally seemed to be much more stressful this year than it should have been, family matters, etc. Not sure how to fix that, but somehow we need to simplify our lives so we can appreciate the things that really matter. On the stitching front I have not made a lot of progress. 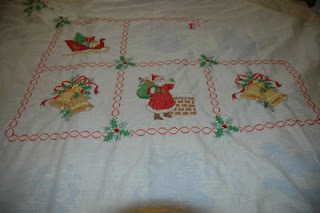 I am disappointed that 'Tis the Season, the lap quilt I have been working on, is taking so long to finish. I have only completed 4 of the 9 squares, and scarcely any of the border. This will takes months more, and then there is the quilting! I am not one of those people who enjoys Christmas stitching after Christmas. Somehow I guess I will have to put it into some kind of rotation, though I have never been very good at that. One very nice thing I got from my husband was Love Is Enough, from Millenia Designs in England. They do a beautiful job on their kits. This one is a William Morris design. I am looking forward to working on this! I have to somehow find the time for it. Of course my main project, THE RUG, is still unfinished, and I must concentrate on that first. I made a little progress on it. I will post a photo later. I still have a long way to go though! Awww, Hermie is lovely. I always love to read stories like this about cats (our cat Tess found us in a similar manner). Your Millennia Designs kit is gorgeous. 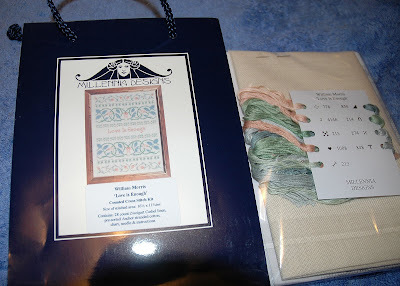 I have stitched a couple of the Kate Greenaway designs from Millennia, and there are many more I'd like to stitch too. What a pretty kitty!!! He needed you. Your quilt is looking good. I have 2 of those blocks done for a wallhanging, a 3rd one about half done. Still one more to go. I had almost forgotten about it. Maybe we should try a SAL. A Snowy New Year's Eve in New York!